Well, the short version is: we made it. This was year five of the Dumb Run, hence DRV. Of those five years, we’ve made it to St Andrews twice. Given that DRIV was a non-starter, that gives us a success rate of about the same as K2 summit attempts. It is best described as an interesting year, I think. 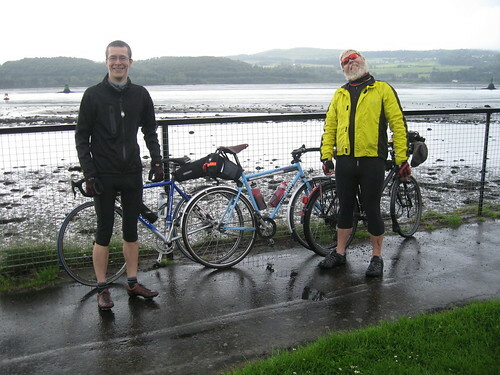 There was the damp, still, midge-infested start at Dumbarton Castle, where we were convinced it was going to be just the three of us before I received the welcome text message saying that another couple of riders were sheltering from the rain down the road. 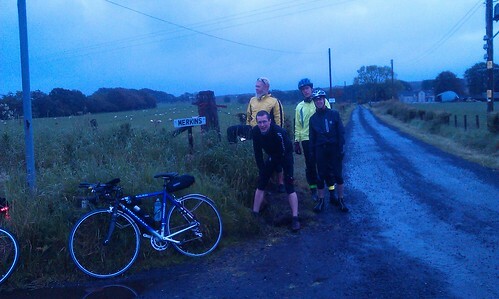 Then the first puncture as we hit Stirling Road, barely 2 miles into the ride. The border collie chasing us up the Auchencarroch Road, barking right behind me on my blind side and scaring me so much I nearly fell off my bike; and Munky doing enough of a dog impression a minute later to give me another fright. We had unexpected encouragement from the nightlife, when we are more used to heckling and occasional hurled stones. We didn’t get lost in Cumbernauld. THE COFFEE MACHINE HAD BEEN REPLACED. My gods. Actual hot coffee. Will’s singing through Linlithgow had to be heard to be believed (sorry, Linlithgow). We made pretty good time through the first half, notwithstanding the fact that I hadn’t done a ride of more than 35 miles in the last two years. I wasn’t left with no legs and lungs made of cream cheese. This was partially a result of Munky’s welcome pacing on the gentle side, and riding Peregrine the Pinarello instead of the fixed; nevertheless I was relieved that I wasn’t a shuddering, weeping heap by Falkirk. 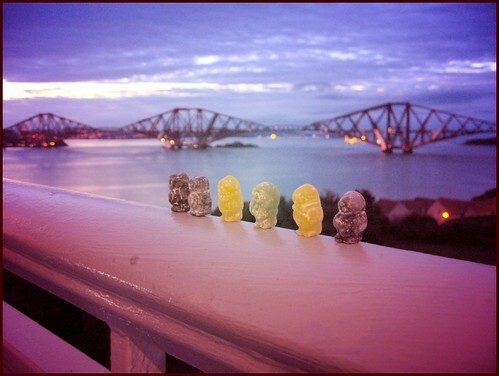 At the Forth Road Bridge we met up with Dave Holliday, got our jelly baby shot and watched the sun turn the sky into molten copper over the Forth Bridge before winding onwards to the Wild Bean Cafe at Dalgety Bay for supplies. Then through Fife, which is always bigger than expected, losing Scoosh at Largo because of time commitments and nearly losing Dave H near Crail when his rear wheel decided to throw five spokes, dropping our pace even further. 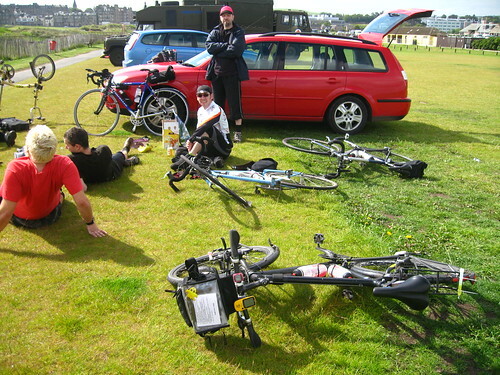 We hit St Andrews after 10am, 200km after we started. Frood was there with beer and edibles and we all collapsed on the grass in the blazing sunshine. It was a good year, although I think it’s the last I’ll be doing a Mother Hen impersonation. In future there will be a stiff warning at the start that anyone haring off into the distance will be expected to take responsibility for themselves rather than having someone chase after them if they miss a turn. There are route sheets for a reason, after all. I think I might also have to warn anyone thinking of joining in towards the end rather than doing the whole ride that people who have been up all night riding across country, especially in wet weather, tend not to be at the brightest and cheeriest first thing in the morning. It’s okay when everyone is in the same boat, but I suspect it’s rather off-putting for someone coming late to the party. My endurance was remarkably good, all things considered, so I am very pleased on that score. Especially massive thanks to Frood for the support. Here’s to Dumb Run VI. Dumbarton Castle, 20:00 (8pm), Saturday June 23rd 2012. At 20:00 hours tomorrow night, a number of cyclists equalling n, where 3 < n < 13 (as far as we know) will set off from the foot of Dumbarton Castle on our annual cross-country trip to the Royal and Ancient Golf Course of St Andrews on the east coast. The ride takes after the much more famous Dunwich Dynamo, another annual nocturnal ride to the beach. A friend of mine, who runs the hugely successful Friday Night Ride to the Coast, observed recently that what makes a successful ride is the story, and the writer in me agrees. The Dun Run is successful because it has as its beginning the ultimate British conurbation of London, and wends its way through increasingly rural environs until it reaches the very opposite of a city: a village that no longer exists, having been swallowed by the sea. The Dumb Run also tells a story, albeit a very different one. The divide between Scotland’s west and east is more than geographic. 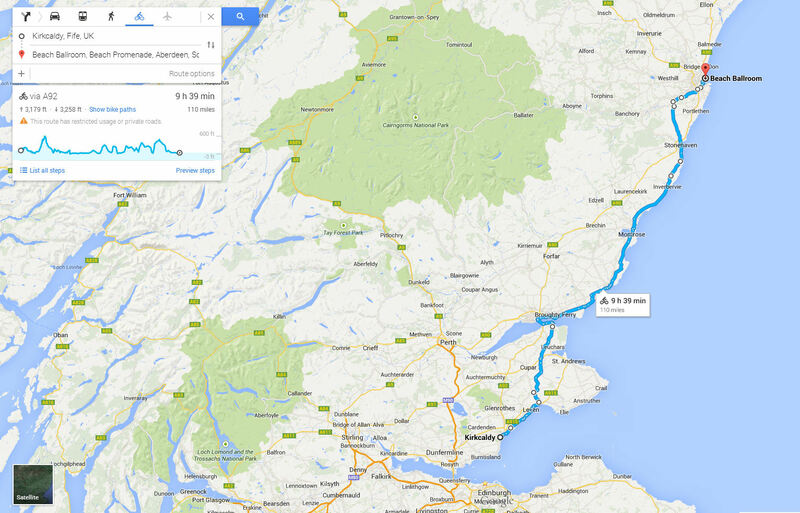 Dumbarton and St Andrews are the start and end point not just because they were handy. We travel from a place that both has the castle with the oldest recorded history of any stronghold in Great Britain and more recent industrialisation in the form of shipbuilding, to a quiet, picturesque town in one of the most visited parts of Scotland, which has the country’s oldest university. We travel from a land of grey ironworks and steel to a place of green grass and sandy beaches. The Clyde is nuclear submarines and religious rivalry played out on football pitches; the Forth is fishing boats, academia and princes falling in love. The journey between the two travels a narrow corridor of quiet A-roads running through the heart of Scotland’s industry: further north it’s all tourism, shooting estates, salmon fishing and distilleries, with the exception of Aberdeen. Here Scotland’s population is concentrated, and we purr through in the night with nothing to show of our presence other than quiet laughter, the whirr of chains and the ticking of freewheels. 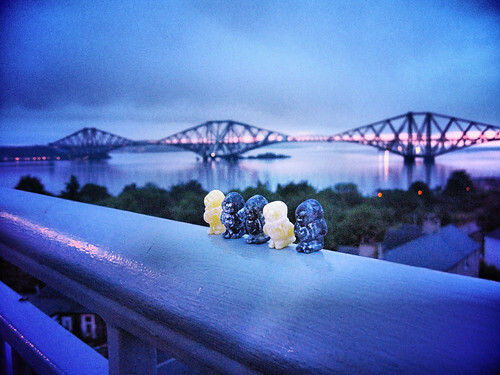 This isn’t the most scenic countryside Scotland has to offer, but it’s dark, so who cares? By the time the sun comes up we’re in Fife, which is prettier by far. The Dumb Run is my favourite ride of all time. I love the Dunwich Dynamo, don’t get me wrong, yet the adventure has gone out of it. It’s not a question of if you’ll make it, but how fast. The challenge isn’t in making it from start to finish but in getting to the front of the queue at the feed stop, finding a place on the coach for the return trip, or getting your bike back without damaging it. The Dumb Run is insanity on wheels. The first 30 miles has midges, the weather is cruel, the itinerant Buckfast Zombies more likely to throw stones than to cheer; the only feed stops are service stations — the coffee machine has been broken in one of them for the past 5 years and the other might not let you in at all. We have only one rule: nobody gets left behind. That’s what makes the difference. This ride is a shared experience. It’s contending with the elements as a democratic collective; supporting one another with practical application of sugar and caffeine, banter and beef jerky, whisky and cake. There’s no way for me to explain what makes this ride so good. You have to do it. You have to be there. You have to experience the highs and lows and the sheer preposterousness of it. It’s not too late to join in. And if you can’t make it this year, check back on Sunday, when the date of DR VI will be posted. It’s nearly the end of May, which means that there are only four weeks to go until this year’s Dumb Run. I’m still holding out hope that I’ll be recovered sufficiently to do it, which means Frood’s on stand-by with the gaffer tape. We’ve already got more takers than in any previous year, but in order to give a taste of what’s in store I’ve posted a retrospective of the rides so far, which you can find here. By my calculation we’re up to ten now. We only need three more for Armageddon. Let’s see if we can do a better job than yesterday’s damp squib. This time we know we can do it! Dumbarton to St Andrews. Overnight. By bicycle. From coast to shining coast, this far north the sun never truly sets. Starting in the zombie-ridden wastelands that bank the River Clyde, we’ll take you first through a relentless set of climbs accompanied by clouds of blood-sucking insects that will bring about significant weight loss if you have to fix a puncture. Then we head into Scotland’s industrial heartland. 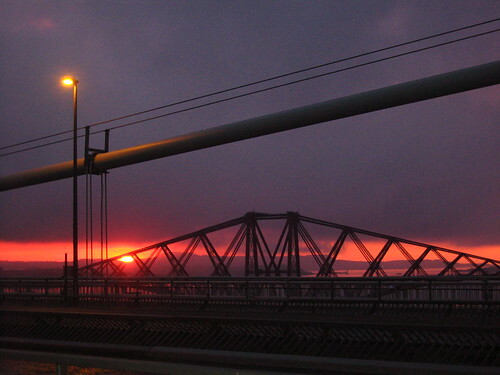 Mile upon rolling mile of near deserted A-roads will see you skirt the Antonine wall and slip ninja-like past Falkirk’s Great Wheel before descending towards Linlithgow, Queensferry and onto the Forth Road Bridge for dawn. Or maybe we will shimmy sideways into the Bladerunner landscape of Grangemouth, nestled against the mudflats downstream of the Kincardine Bridge. This year anything is possible. And it doesn’t end there. Take possibly your last chance of respite at the Wild Bean Cafe at Dalgety, where last year they let us in for fresh croissants and hot coffee, and steel yourself for the interminable crawl around Fife’s sultry coast for a mid-morning finish by the grey North Sea. There is no support. That’s why the gods invented multitools and puncture repair kits. There is no mid-way feeding station. If you’re lucky you will manage the navigational hazard that is Cumbernauld and find the all-night services (if you are really lucky it won’t be full of Barry Manilow fans, like it was last year). There is no transport to the start. How you get there is a matter of personal logistical planning. There are no return coaches. What do you think this is? Butlins? Oh, all right. We might manage some disposable BBQs and a sausage on the beach, if it’s not raining. And we can probably stretch to a beer or three. But only if you let us know you’re coming. Otherwise you can find your own beer. And we won’t make you do it fixed. Not if you don’t want to. There are few things quite as surreal as those you find cycling across Scotland’s central belt in the wee hours of one of the shortest nights of the year. Why don’t you come with us and see them for yourself?